Write in a variety of modes (e.g., summary, explanation, persuasion, informational, literary analysis, creative expression). � Select a medium or format appropriate to purpose for writing, and maintain focus on the purpose. � Effectively vary strategies (e.g., provide facts, describe the subject) to achieve complex purposes. � Select a medium or format, arrange supporting ideas, and craft diction and tone that anticipate the audience�s needs. � Anticipate problems, mistakes, and misunderstandings that might arise for the audience. � Translate technical language into non-technical English. 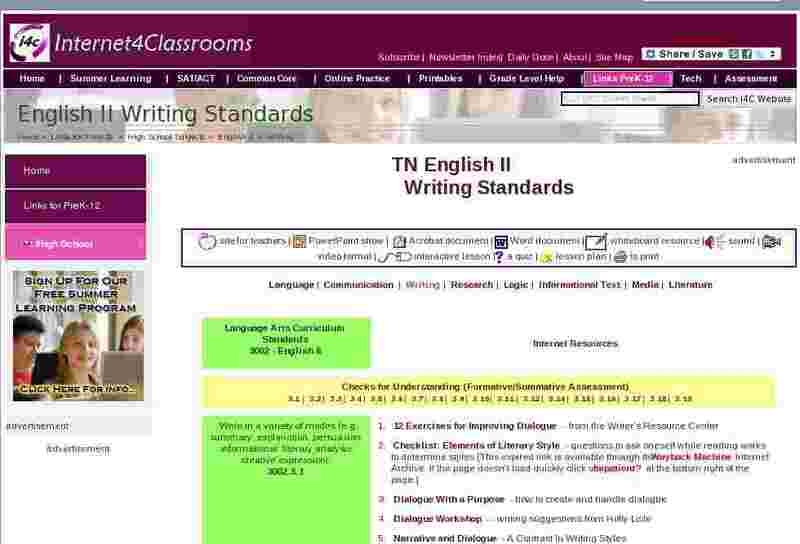 � Provide ideas, examples, and comparisons to support the main points in the text. � Follow customary formats (e.g., use salutation, closing, and signature for business letters, and format for memos). � Use a variety of techniques to format the text. � Effectively employ formatting and other visual elements (e.g., headings, bulleted lists, effective use of white space on the page). � Use graphics and illustrative material effectively to support ideas in the text. Develop topics that address unfamiliar concepts removed from the student�s personal experiences and require in-depth analysis. Use a variety of strategies when appropriate (e.g., comparisons, anecdotes, detailed descriptions) to provide facts, details, reasons, and examples that support and support the thesis. Develop ideas as appropriate to audience and respond to readers� potential questions and counterarguments. Employ varied and appropriate organizational structures that support the topic. Use transitional words and phrases to signal organizational patterns and to indicate relationships among ideas. Create text features (e.g., headings, subheadings, formatting) as appropriate to signal important points. Use precise language, considering audience and purpose (e.g., technical writing, creative expression). Use compelling verbs and a variety of figurative language (e.g., personification, sarcasm, word play) for effect to meet the needs of audience and purpose. Use a variety of correct sentence structures for effect. Formal Language in Reports - rewrite sentence using formal language. � Acknowledge source material and create a reliable bibliography in a standard format. � Cite sources using a standard format (MLA, APA) with a high degree of accuracy. � Appropriately quote, paraphrase, or summarize text, ideas, or other information taken from print or other electronic sources. � Correctly incorporate ideas within text. Generate notes while collecting information, following a logical note-taking system. Revise to craft a tone, mood, and style that convey the writer�s attitude and are appropriate to audience. Use both basic and specialized software to incorporate graphics into writing products. Proofread a passage for correct punctuation and mechanics. Proofread a passage for correct English usage. Select the best paraphrase of a given reading passage. Select a vivid word (e.g., adjective, adverb, verb) to strengthen a written description. Determine the most effective placement of information using a prewriting graphic organizer. Rearrange the order of supporting paragraphs within a writing sample given a specified organizational pattern (e.g., comparison/contrast, chronological). Determine the writer�s purpose in a nonfiction writing sample (e.g., narration, description, persuasion, exposition, creative expression). Revise or identify sentences using effective parallelism within a writing sample.